As seen in this picture from Discord the transfer switch track has been installed today. 3 maintenance bays as predicted. Pear and Phantasiastisch like this. I agree that it looks strange but it's also funny to see. Unbelievable, unique and fantastic as (almost) everything in Phantasialand. Also on Instagram aerial pictures from kazuch1983 have surfaced giving us a look at the theming that has been completed so far. peep, Pokemaniac and Phantasiastisch like this. I have been thinking after seeing this new picture on PhantaFriends.de. If we look at that picture and go out of the idea of a lake in the middle of Rookburgh and connect it too the illustrations of Rookburgh from Phantasialand itself. Then it looks like the clouds are blocking the view of the lake/water. The buildings are standing in an L-shape, probably on the side of MaC and the back of the Berlin street. I also looked at the billboard again and searched for some Steampunk pictures. Similar: the bridge from the one building to the other. Seeing this picture gives me the thought that the buildings with the bridge between them, will be as main entrance from the Fantasy area. On the billboard you can see the coaster track going inside so there will be a darkride part. As most people think the trains will go up the lifthill... I'm thinking that after the darkride part the train goes down the lifthill into the exit station. 1. The blue color is lake. 2. The brown platform in front of the clock tower building under the inversion is going to be a dike next to the lake. Underneath the dike/brown platform will be a darkride part where the train faces the lake and the riders can see through glass what's going on under the water. Some other fantasy: There is a Steampunk submarine on the water. 3. 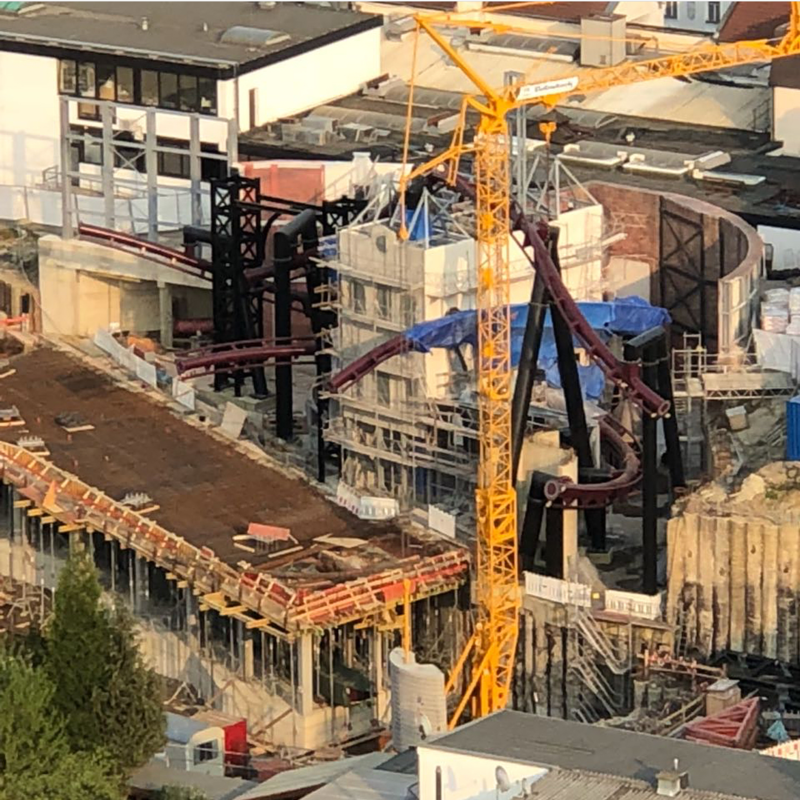 The new entrance from Berlin will go between some buildings and maybe they'll hang a zeppelin between these buildings or on top of the already standing alleyway structure so the front of the zeppelin will be sticking out a bit into Berlin. 4.. The foundation of the second attraction gives probably the shape of the building which could be as on the picture below. 4. Main entrance with that buildings that are connected via a bridge. 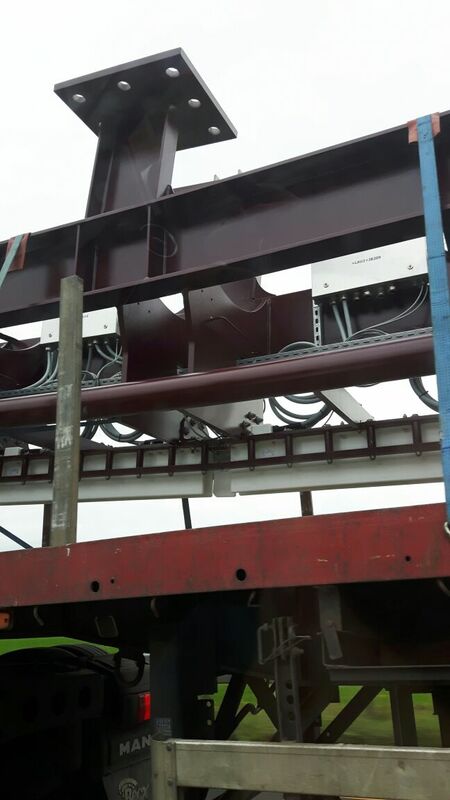 Here the coaster goes inside to the second darkride part which will end with the lifthill that will lead the train to the exit station. That's why it came up in my mind. I think they're going further than with Taron. If it would be like this, it would blow my mind. Just thinking of a darkride part where you're looking under the water surface, a zeppelin between the buildings, a submarine on the water, the giant bridge as main entrance... It sounds crazy but if I would expect such a masterpiece of a themepark, then it certainly would be Phantasialand. The lake wouldn't be abnormal when you think about Manta, with near miss effects. Thw lake would also give a more open feeling and make the area look bigger. I think with this lake the setup could be as the Chiapas area. In such a compact area with many buildings, pathways, toilets, ride queues, food outlets (+ most likely a restaurant), maybe another as yet unannounced attraction and the world's longest flying coaster there is no way that there will be a massive lake taking up most of the area. It'd be a waste of space and make everything around the sides too compact/ impossible to fit. None of the concept art has hinted at anything water based. Just a flight + industrial/factories steampunk theme. I can't see it fitting thematically. There is also a massive lake right next door in the Wuze Valley. Although I would like some sort of nice water feature for the coaster to interact with like Taron's waterfall or Manta. But a massive lake will just not happen. But if we assume that there will be something else there could it have to do with a second attraction? 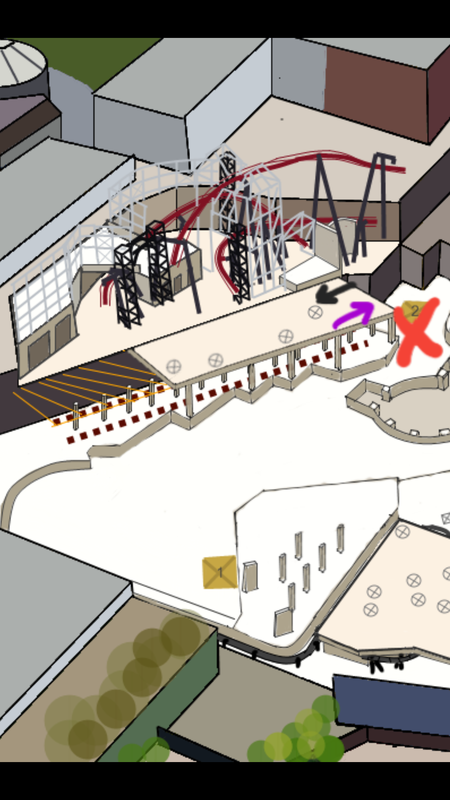 An underground dark ride resulting in a Hollywood Tour with Temple of the Nighthawk on top style complex would be great but I can't see them having the space for anything decent. Could the round end be for a flat ride? Or a simulator ride - be it Flying Theatre, Intamin Ultra Tower or something similar? And to indulge in further wide speculation if there is another attraction in that corner - the Schauspielhaus, currently the Pirates 4D cinema, is next to it. 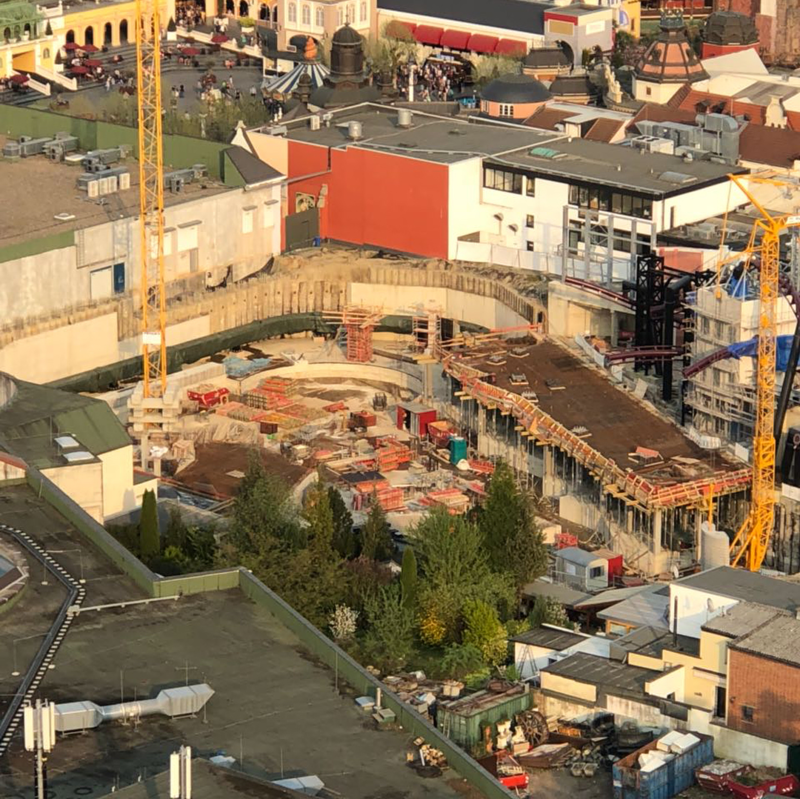 Given the speculation about it being removed and turned into a new large Guest Services after PHL's recent hint at that (as reported in the Phantasialand Improvements for 2018 thread) - what if (because the space is far too big for just a guest services) they spilt the inside of the theatre in two: one half is the guest services and the other half could house the queueline for a second Rookburgh attraction? 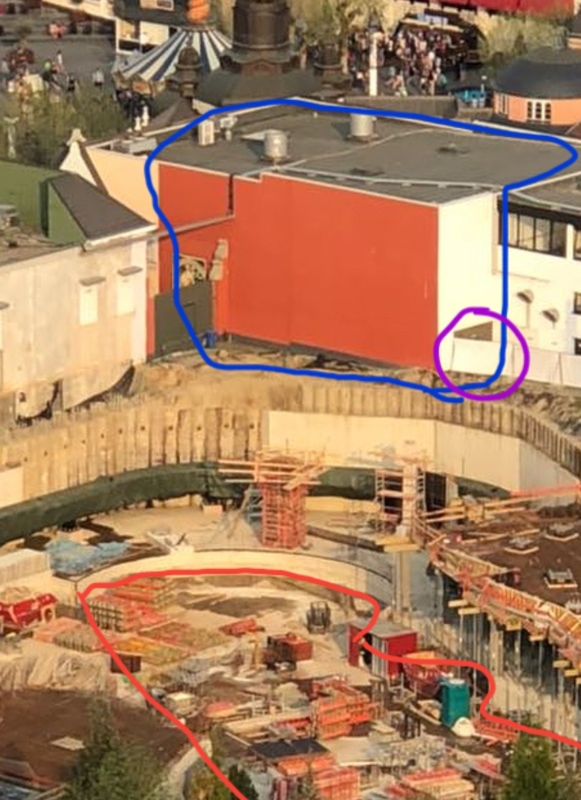 In blue I've outlined the Schauspielhaus and in purple marked the already existing fire escape doorway on the Rookburgh side (obviously new door ways could be made). Then again though there still too many variables and questions about what may Rookburgh contain to accurately predict anything for that centre spot yet. Best to wait and see what develops there. Bartwurst, hey--hey-ho, peep and 1 other person like this. I'm expecting some form of water feature in Rookburgh. Small water features are scattered everywhere across the park and in each area, so I'd be surprised if they didn't include something, even if it's just a hidden waterfall or something. A full out lake though? Nah. I highly doubt they'd add a massive lake in the centre of the area, it wouldn't actually 'feel' right. Steampunk fits itself more to industrial buildings, overcrowding, compact streets and transport. Yeah, that would absolutely work. Just not having a huge lake in the middle that wouldn't really fit. 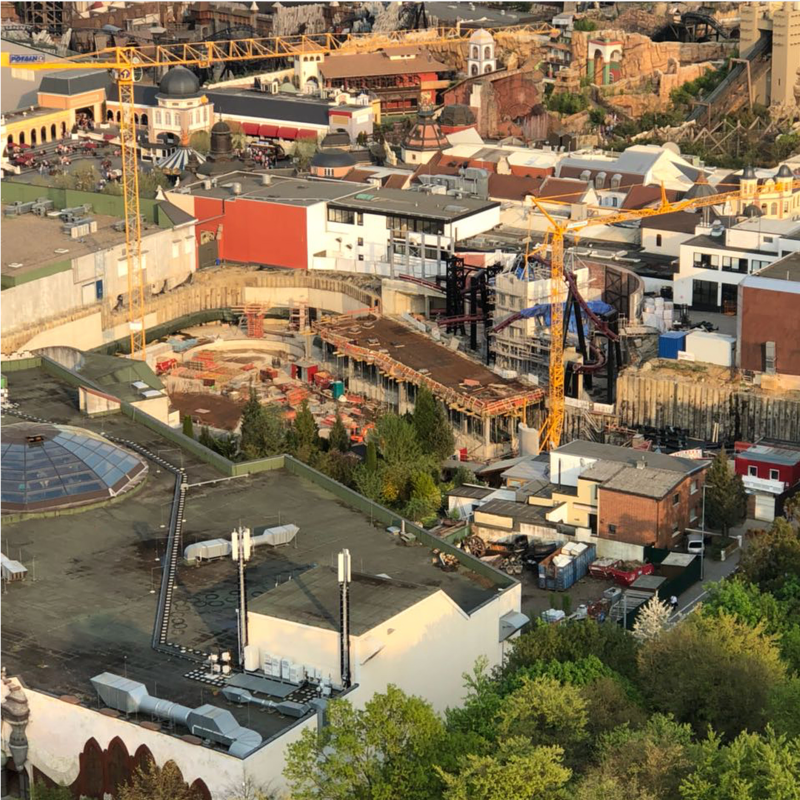 I looked back at this picture about which CSLKennyNI mentioned that he also thinks it could be that the Schauspielhaus could become a queue line or something else for a possible second attraction. The passage/ emergency exit stays, no doubt about that and I see no tunnel. In other words, it is highly unlikely that the building of the Schauspielhaus at Rookburgh will be part of the Rookburgh area and will act as queue line or something. Isn't it? Yesterday the Barth crane returned to the construction site and @parkerlebnis on Twitter managed to get this picture of a new support being lowered. toofpikk, Steel & Story and JoshC. like this. I wonder where this steal horizontal bar (circled in red) is gonna be used for? This is right above the gate, isn't it? Maybe the gate is gonna be replaced by theming which reaches to that hight to hide the back of the wall-construction? That is a duct currently being used to carry electric cables. Presumably it will be enclosed/covered up when they create some sort of new archway/gateway there into Rookburgh. 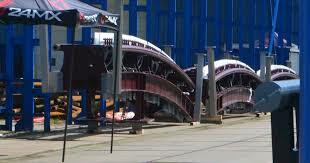 Is F.L.Y the only known ride that will be in Rookburgh? Is F.L.Y. the only known ride that will be in Rookburgh? Yeah so far all they've announced is the flying coaster and confirmed that there will be a culinary offering (presumably food outlets and/or a restaurant). But I'd be surprised if there wasn't another ride for the family market (same as how Klugheim also featured Raik). It has been reported on PhantaFriends.de today that this morning more supports have been delivered. Tobi has reported on PhantaFriends.de that there continues to be a lot of activity on site. A lot of supports have delivered and are being stored on site. Below graphic: purple arrow = location + direction of the launch and in the neighbouring tunnel the black arrow = break run direction. 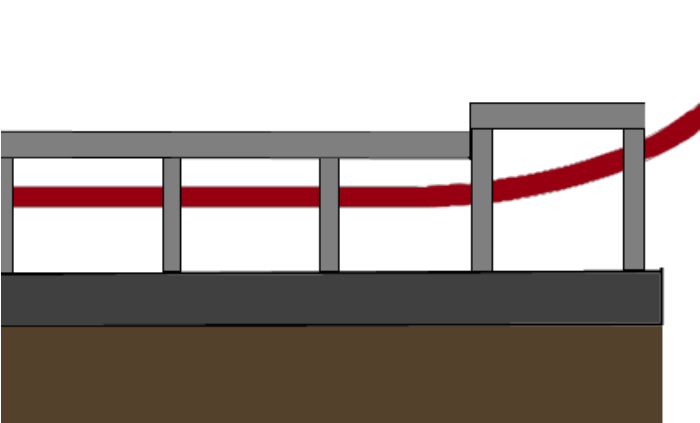 At the end of the launch tunnel, on the spot marked with a red X, a complete support has been erected. The support's two unusual square flanges match those of the curved launch track parts. the new ceiling over the break run and launch is at one end higher. Presumably to accommodate the beginning of the launch's curvature. ... and into the extremely curved parts. 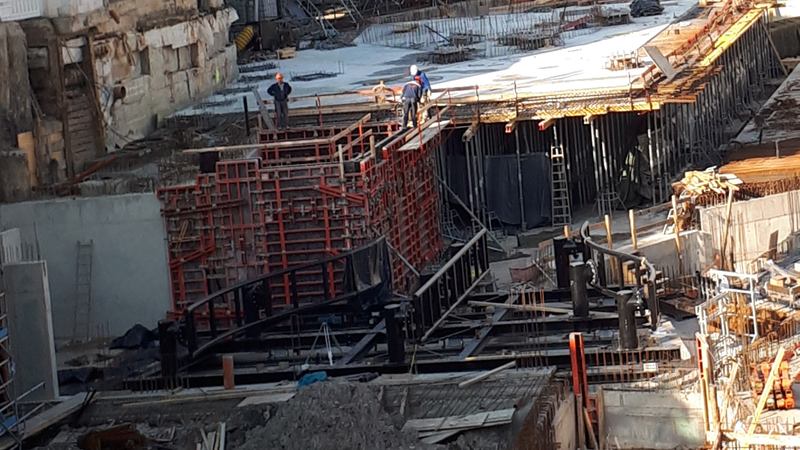 Supports have also started to be erected on the footers on top of the concrete slab that forms the ceiling of the launch and break run tunnels. Steel & Story likes this. So does this point to an outward-facing half loop after the launch, similar to that on the Stingray model? Just returned from a few days at Phanta and the one thing that really struck me with this is the size of the track is so much bigger in person than the perspectives show on photos. It's actually quite huge. The entire week up until late in the evening they were working, a lot of supports seem to have been moved around.